to facilitate conflict resolution for the participants, which promotes the development of life skills such as empathy and negotiation, and wherever possible transforms negative outcomes such as aggression into positive enriching interactions. ‘… we are actually setting them up to always be reliant upon others.’ (Bilton, 2010). A child’s initial response to a conflict situation will be overwhelmingly determined by previous life events and experiences. Most importantly, these will include the norms set within the child’s own family – especially how parents handle personal conflict, as well as the child’s relationship with other siblings and friends. In this sense, a child’s starting point can be established by considering three interactive factors: temperament, disposition and conflict experience. These are now considered in turn. 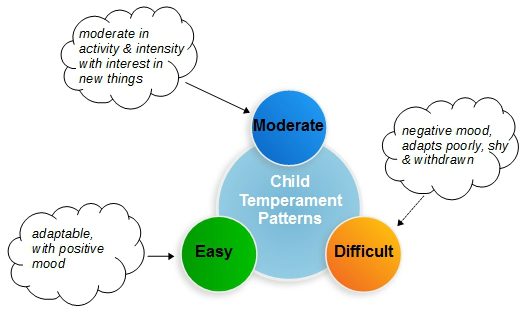 As a result of their long-term study, the authors determined three common patterns of temperament characteristics: easy, moderate and difficult. 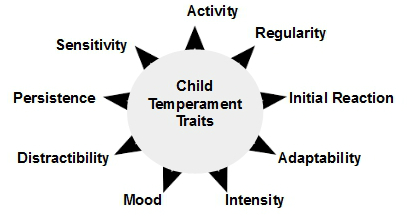 Figure 2 shows the category descriptions adopted to outline the nature of children in each respective classification. Critics will rightly caution that labelling a child can create a self-fulfilling prophecy – for example practitioners may approach a ‘difficult’ child expecting certain outcomes, therefore perhaps ignoring other outcomes which don’t ‘fit’ with that assessment. However, provided this danger is kept in mind, adapting one’s approach according to whether a child is proving ‘intense and active’, or ‘moody and sensitive’, simply increases the chances of connecting well with that individual. Furthermore, as well as being the essence of good practice, acknowledging where the child is at and working from that position also maximises positive development. Though temperament is innate, anyone can grow as an individual – especially when given sympathetic support. Hence the value of assessing and classifying temperamental attributes to inform childcare best practice. 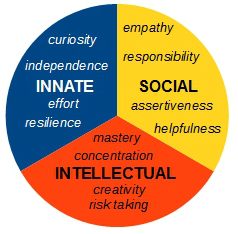 As shown in Figure 3 below, dispositions can be helpfully divided into three particular areas: dispositions which are considered innate, such as curiosity and the ability to bond; dispositions which are primarily social, such as friendliness and a readiness to cooperate; and dispositions such as questioning and problem-solving, attributes which contribute to learning and intellectual development. 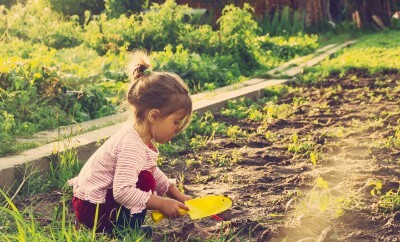 Once recognised, these habits of thinking and doing naturally include dispositions which are of positive benefit to the child, such as empathy and resilience. But equally, there will be other dispositions, such as being selfish or impatient, which are considered relatively undesirable in most contexts. 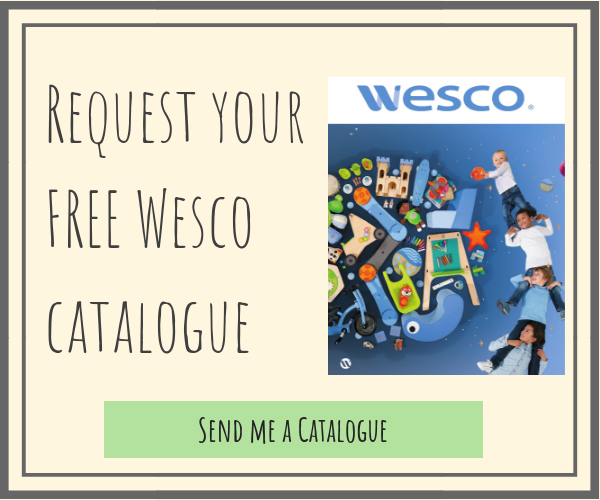 For practitioners, the task is always to look to promote desirable dispositions whilst also weakening the impact of those which are likely to have an adverse or detrimental impact upon the child’s development prospects. Common sense, confirmed by research outcomes, implies that a child’s early experience of family conflict situations will tend to shape the strategies that the child is likely to adopt in later conflicts involving other children. 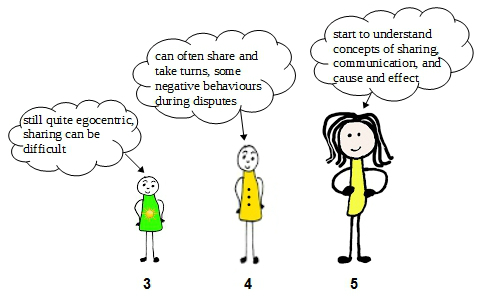 The basic aim of all such strategies is to move children from confrontation to negotiation, a process which Thornberg characterises as progressing from ‘simple conflict’ to ‘elaborate conflict’ (see Figure 4). One advantage of this easily remembered approach is that it’s simple enough to be used by younger children too. Assemble: A calm and impartial gathering of the child participants which uses a soft voice and eye contact at child level. Affirm: A fact-finding moment which describes the narrative from each perspective and acknowledges the feelings of all (a sportscaster role). Recap: A restatement of the incident and issues, in suitably paraphrased format, which both confirms to the participants that their problem has been heard, and also ensures each hears the other’s perspective. 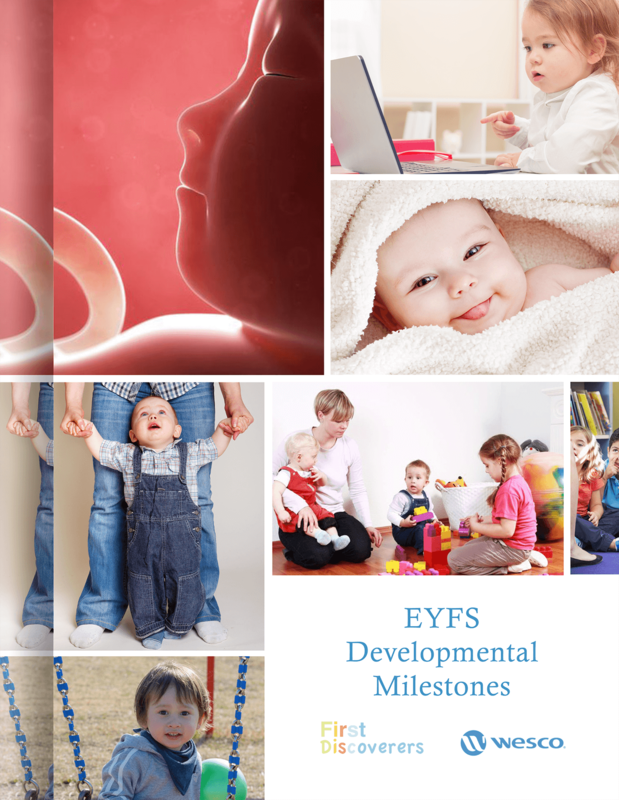 Extract: Informed by the previous step, a phase in which important details are checked with each child in turn. 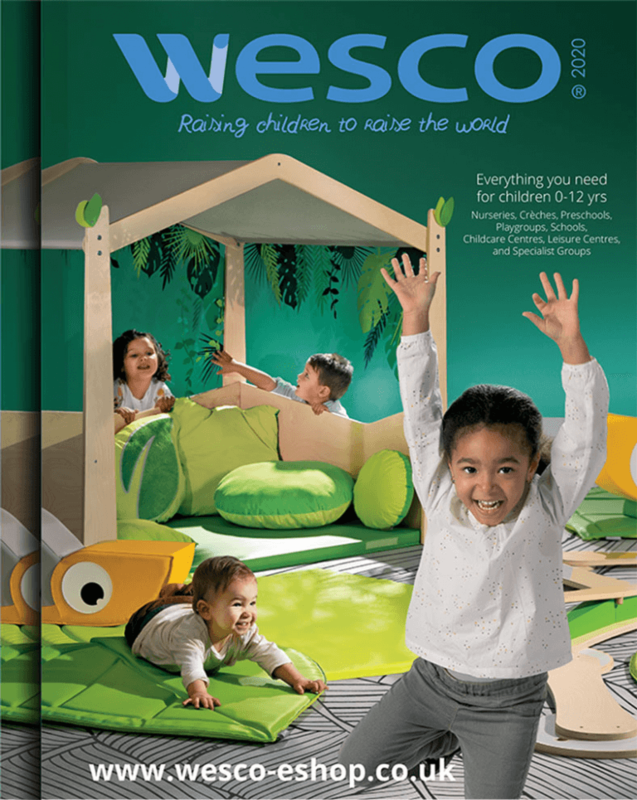 Solve: A set-piece stage in which the childcare professional encourages all of the children to develop a solution. Encouraging broad participation to ‘learn the lessons’ of such encounters and creating an atmosphere of tolerance and reconciliation are the major aims of this routine. Backup: Provide any adult support necessary for whatever solution is to be trialled. Praise: Offer generous verbal encouragement as the proposed solution get under way. Perhaps the hardest part of any conflict strategy is knowing when not to intervene. It’s always a fine judgement, but if as an adult monitoring the situation you can see no one is getting hurt and that some problem-solving behaviour is emerging, then there’s usually a strong case for holding back and watching how things develop. This response assumes a developing community awareness in which childcare professionals can lay the groundwork which helps children to become more emotionally intelligent. 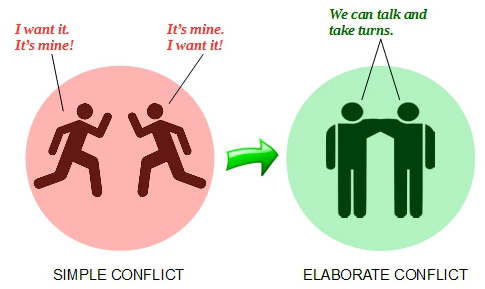 These principles can then be brought into action and embedded and refined as necessary during the course of conflict mediation. 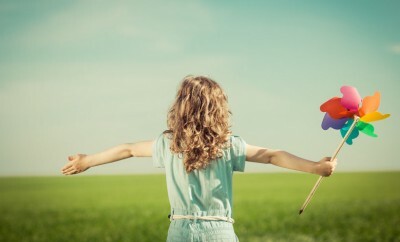 Giving children the chance to participate in decisions which will affect the community (e.g. how certain classroom spaces are used). 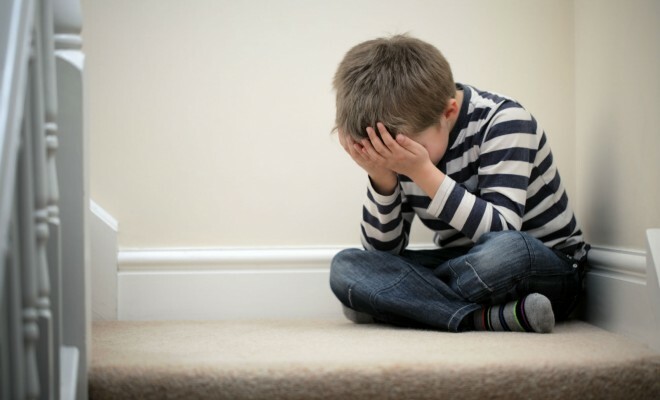 When children primed with such learning witness and experience conflict situations they are then much better placed to handle the powerful emotions such episodes can often release. And furthermore, they will be acquiring and practising a set of social skills which will last them a lifetime.